One of the most noticeable innovation in Isatis for the Contaminated Site Industry is the Streamlines Calculator. 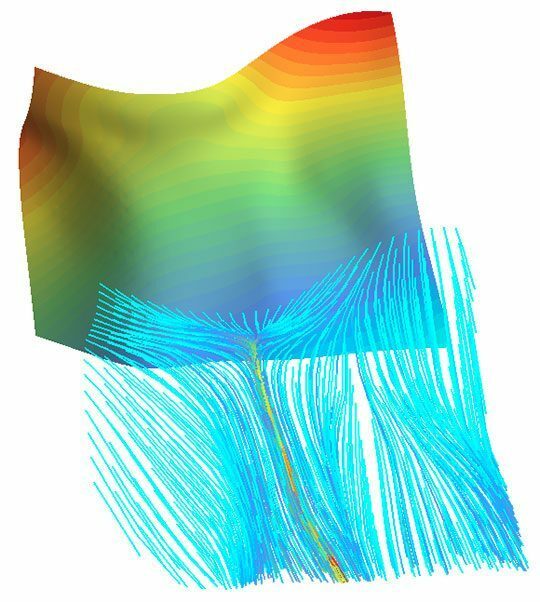 This application is designed to compute flow path lines according to a 2D surface. It has been successfully used in our consulting projects either with topographic elevation and hydraulic head. The lines are iteratively computed along the local steepest slope. They can start from a given initial set of locations that may discretize the whole area or represent specific points. For our clients, it first enables flow comparison between different aquifers. It also simulates the contamination from an entrance point as well as the back analysis of the upstream area leading to a contamination observation at a specific piezometric well. It is a simple, quick and efficient tool to better understand contamination in groundwater. It can be used prior to more advanced transport modeling achieved with other software packages.